The full Turtle Journal team hit the field this Saturday morning to check for hatching diamondback terrapins and stumbled across a most awe-inspiring moment: the miracle of birth. 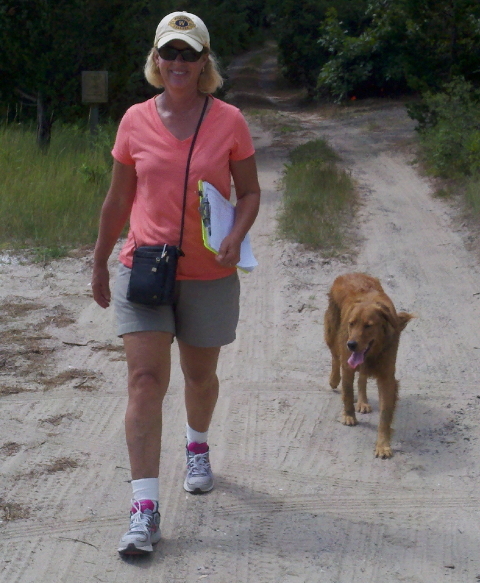 Sue Wieber Nourse, the one with the clip board, and Rufus Wieber Lewis, the four legged researcher with red hair and pink tongue, patrolled Lieutenant Island’s Marsh Road and Turtle Point for signs of emerging nests. At the high dune of Turtle Point, the team discovered several nests on the cusp of “pipping.” In one nest, three of the babies were advanced enough to be born in front of our video cameras. 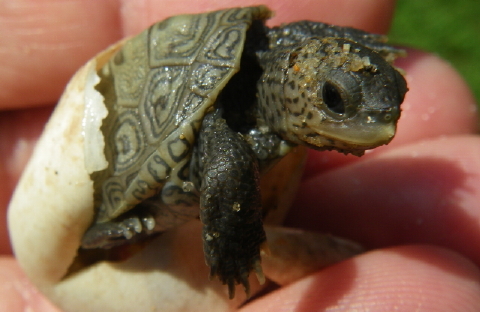 We didn’t have to wait 48 hours; we didn’t have to wait 24 hours for the first 2011 terrapin hatchling to emerge. This afternoon, shortly after we discovered a pipped egg in Nest 368 (see posting immediately below), we found a hatchling near the bottom of the nest that was scratching its way to freedom. 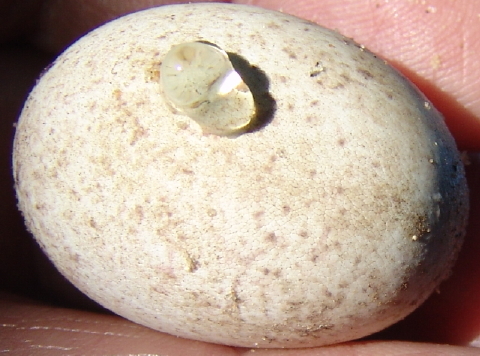 Hatchlings use their temporary egg tooth to pierce the hard shell. Once a hole has been cut through the egg, the hatchling widens the opening with its sharp and strong claws. About four to five days after the egg is “pipped,” the hatchling has absorbed its large yolk sac sufficiently to emerge from the egg, tunnel to the surface and scramble to the safety of vegetation. This hatchling has ripped its shell apart and has managed to squiggle free. It will shortly be released into its native salt marsh nursery habitat south of Lieutenant Island in Wellfleet on Outer Cape Cod. In the next few days, hatchlings will begin emerging from nests throughout Southeastern Massachusetts. Keep a sharp eye to the ground and let Turtle Journal know if you discover hatchlings emerging at our 508-274-5108 hotline. A diamondback terrapin hatchling pecked a tiny hole in its egg about 1 pm this afternoon, August 19th, after 63 days of incubation. This egg came from a nest deposited on June 17th inside a slate stone walkway off Lieutenant Island’s Marsh Road and relocated to Turtle Point for safety. 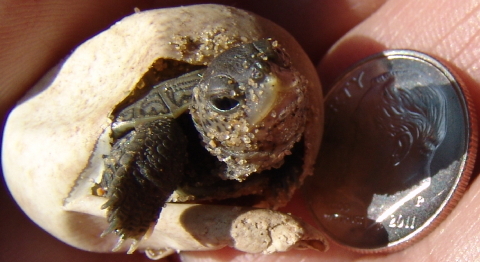 Turtle hatchlings are equipped with a tiny sharp egg tooth that they use to “pip” through the egg shell. Once the shell is pierced, they use their sharp and powerful claws to rip open the egg. The process from initial “pipping” until emergence can take from four to five days, during which time hatchlings are extremely vulnerable to predators from insects to raccoons. 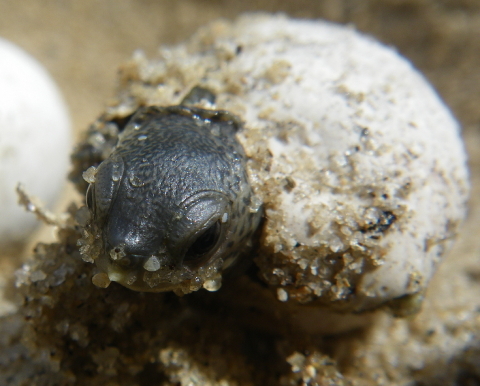 Turtle Journal expects to see our first emerged hatchling of the season within the next 24 to 48 hours. Too soon! Far too soon!! 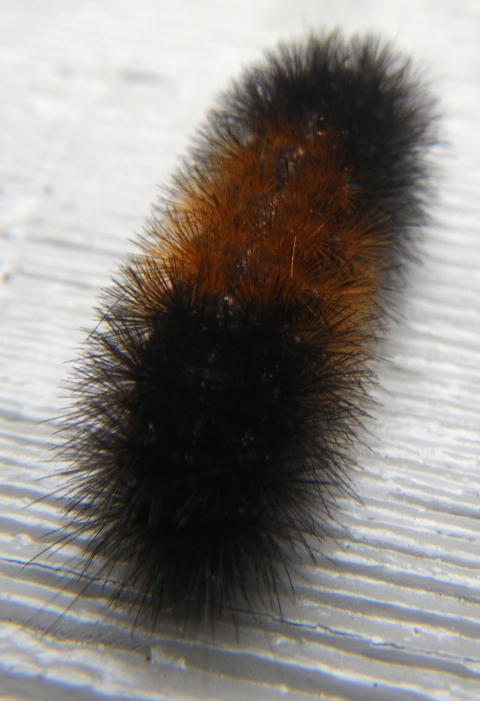 This afternoon a woolly bear caterpillar … the larva stage of the common Isabella Tiger Moth (Pyrrharctia isbella) — strolled onto the back deck of Turtle Journal Headquarters. “It’s only mid August!” I cried, but alas Nature would not listen to my plea. You are currently browsing the Turtle Journal blog archives for August, 2011.